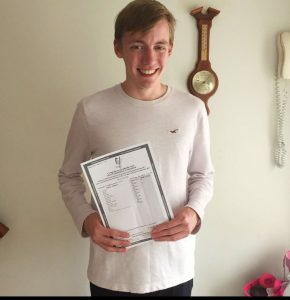 Sean Smyth completed his Leaving Cert in 2017 and achieved the maximum 625 points. He is studying Primary School Teaching in DCU. “When I look back on my first day in Firhouse Community College, I realise how much I have changed in the past six years. I have learned a lot – from an array of Hamlet quotes to some invaluable social skills which have helped me grow and evolve over these past six years. My first year in the College went by in the blink of an eye. Before I knew it, I was facing a three-month long summer break. I had been guided through my first year of exams, new subjects and the one-way systems of the corridors by my tutor, yearhead and prefects. I never once felt lost, but instead I felt at ease. As the years went on, my friend group expanded and my enjoyment of school increased. I surpassed milestones like the Junior Cert and my first trip away from home, all with the help of my teachers. Looking after the students was always their best interest, and it is something that has stuck with me, especially now as I embark on my new journey to become a Primary School Teacher. The Pastoral Care Team in the College is something which is invaluable to the school. Whether it was the nerves of First Year or the stress of Sixth Year, there was always someone to confide in whenever I had a problem. My tutor, Ms Harney, took an interest in our growth and always supported us through our highs and lows from the beginning to the end of our time in Firhouse Community College. One memory which sticks out is taking part in Darkness Into Light in Transition Year. It was a dark, cold Saturday morning and 50 students from my year group, accompanied by several teachers, headed over to Phoenix Park to show our support and appreciation for Pieta House. Through all the students coming together, we raised over 900 euro for the charity! This really helped me learn the importance of coming together and working to help others. It was one of the many times Firhouse Community College taught me that there is more to life than academics – this is a lesson I found so valuable, especially throughout Senior Cycle. The two years of Senior Cycle were tough but the hardwork and dedication each of my teachers showed to us pulled me through. There were teachers hosting extra classes at 8 in the morning, or those correcting extra homework with individual feedback on each. I owe a lot to those teachers who worked hard and helped me achieve the grades I dreamed for in the Leaving Cert. It is one thing to have good teachers in a school, but to have a staff with that amount of dedication to a class is something I know not every school can say they have. Even with all the hard work and the inevitable Leaving Cert fast-approaching, we still had fun and those will be the days that I will miss. I head to DCU in a few weeks and it will be sad not seeing the same, familiar faces everyday – but I have no doubt that the lessons I learned in Firhouse Community College will stick with me as I make my way through college.